When runaway Eve is approached wealthy siblings Bain and Bridgette, she is wary. They tell her she looks exactly like their missing cousin Aurora, and they present her with a tantalizing offer: impersonate Aurora until her eighteenth birthday a few weeks away, and when the three cousins are granted their trust fund, disappear with $100,000. Eve knows that being an impostor is a dangerous game to play, but she's desperate for the money and to see what it'd like to be in a family. She plays her role almost too well, and everything is going as planned...until the ghost of Aurora's dead best friend begins haunting Eve. Eve tries to find out what Liza wants, and along the way uncovers secrets about the night Liza died and Aurora disappeared. 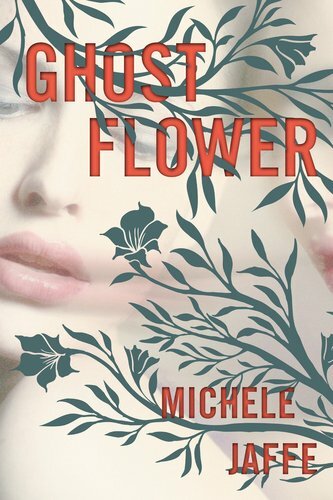 Michele Jaffe's Ghost Flower is a very suspenseful and mysterious novel that will ultimately leave you with more questions than answers. It's evident early on that Eve-turned-Aurora is an unreliable narrator, but the way she presents herself and the tiny snapshots of her troubled past make her more sympathetic than suspicious. The finer details of Bain and Bridgette's plan, their secret motives and relationships, and how Aurora is set up to pull of the impersonation is fascinating and very entertaining, even if the games she plays with all of the family members seem dangerous. The haunting and Liza's ghost is another very creepy aspect, but what makes this story so compelling are the peculiar family dynamics that control the main characters. As readers get closer to the end, lines become blurred and identities are questioned, but there is a bit of closure for Aurora and the readers. Nonetheless, this is a mind-bending thriller that will keep readers wondering after the final page. 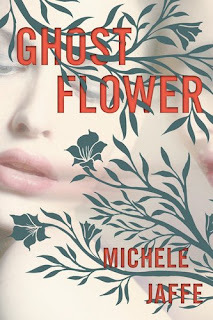 Cover Comments: I love the ghost flower motif on the cover and on the pages inside--it's pretty and mysterious and very fitting for this book! I guess that was a "Walmart exclusive" cover. I hated it! I'm not a big fan of the cover to be honest, it doesn't draw me in very much. But the book sounds kind of cool. I like the idea of the mysterious ghost haunting Eve. Great review! This one sounds super weird. I probably wouldn't pick this up if I saw it in the store. Not a very pretty cover. I don't usually enjoy thrillers either but it's cool to switch it up with different genres.